Did you ever play the game "Slug Bug" when you were young? It's something my mom and older sister played for years together. My mom was the funniest at it; she'd get so excited about spotting a Bug, and instead of friendly "slug," you'd get a real one. Sitting shot-gun wasn't always the best seat in the car. This is the way I remember my childhood memory, I wonder if it's the same for my sister. I've since passed on the tradition of playing it with my own kids, and as you can imagine, it was taken to an entirely new level with 3 boys. Permission to hit people? Awesome. It got out of hand fast, so we altered the game to only spotting Bugs not slugging for them. I thought it was a game killer for sure, but surprisingly they still wanted to play. Since cruising Baja, we've discovered that Bugs are EVERYWHERE. 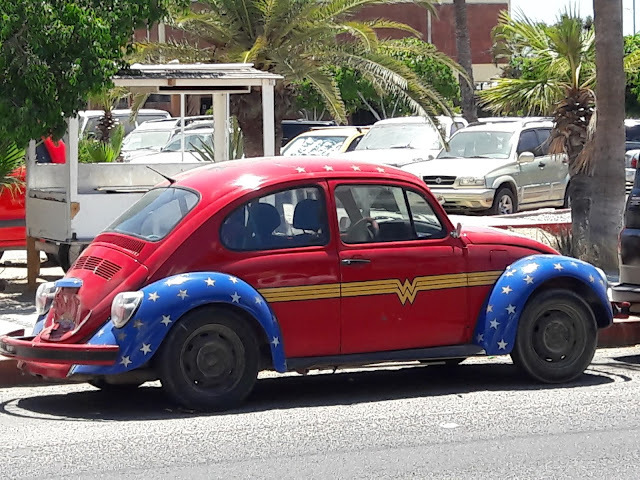 From Ensenada, Cabo, and La Paz, there are a ton (way more than the U.S.) of VW Bugs, new and old, but especially old. As a VW lover (my first car was a Jetta) it makes me very happy. During our time in Ensenada, we borrowed a car from fellow cruisers "Roamin." There we discovered our epic "Slug Bug" game had jumped to a whole new level. So we added another layer to the game. If you got a "slug bug," you had to call out it's color in Spanish. I thought this was a clever way to help them learn their colors in Spanish, and it worked! They learned their colors! In honor of Wonder Woman coming out in theaters today, I present the best Bug I've found so far on our journey...The Wonder Woman Bug! Found on the streets of La Paz.